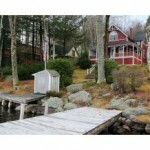 Victorian lakeside home in Sunapee Harbor. Numerous classic features include architectural details, oak pegged floors, living room fireplace with period oak mantel. The best of the old has been carefully paired with new conveniences. 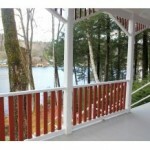 Wrap-around porch with stairs to the lakeside dock and deck. Deep water docking and sandy swimming. Above the street-side garage, find a cozy guest apartment. Walk to Sunapee Harbor fun! Listed by Harbor Light Realty. 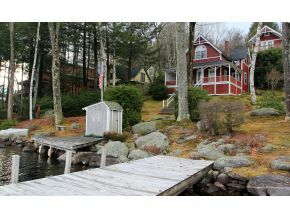 Lake Sunapee is just over 4000 acres, this deep water lake is known for some of the best salmon fishing around and is home to one of the largest Star Fleets of Sailboats around. Summer fun includes water skiing, tubing, sailing and cruising the lake. In the winter you are minutes to Sunapee Ski area and some of the be DN Class ice boating around. Built in 1893 this home has been completely updated. The home has 9 rooms with 4 bedrooms and 4 bathrooms. 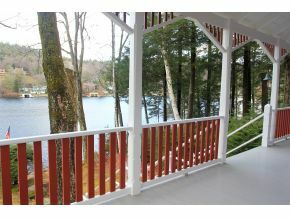 For additional information on this Sunapee home call Lady of the Lake Realty at 1-888-737-5550 or e-mail at info@nhlakesrealty.com or visit our website to view similar lake homes in New Hampshire at www.nhlakesrealty.com or www.lakeorskirealestate.com.